This stock just hit a 52-week milestone. Where will it head from here? Shares of CARBO Ceramics (NYSE: CRR) hit a 52-week low on Friday. Let's look at how it got here and whether clouds are ahead. 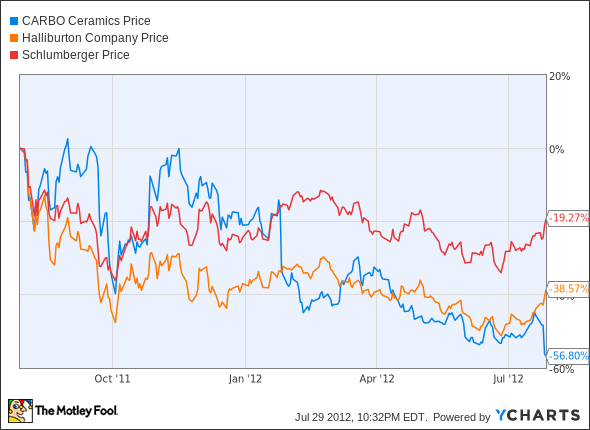 Financial results have never been better, but CARBO Ceramics can't seem to catch a break from the market. Fresh off a better-than-expected second-quarter earnings report, the company's stock has hit a new low as investors fret about competition and the level of drilling in the industry. Revenue rose 19% in the second quarter to $177.6 million and earnings per share rose from $1.28 a year ago to $1.38 this year. These were better-than-expected results, but competition is beginning to catch up and the slowdown in natural gas drilling is affecting service providers. Management reiterated cautious comments about the industry's shift away from natural gas drilling to liquid rich plays and an oversupply of Chinese ceramic proppant. Halliburton (NYSE: HAL) and Schlumberger (NYSE: SLB) have followed a similar negative path as CARBO for the past year as the fracking market deals with low gas prices and new competition. Compared to these service providers, CARBO Ceramics is providing a nice value and has no debt on the books. Earnings aren't expected to rise this year, so the P/E ratio won't likely fall but a strong return on equity and a good balance sheet make the stock look more attractive. The one thing we know is that fracking is still new as a drilling method and the overall opportunity will continue to grow. I think competition from China will continue to put pressure on the industry, but CARBO Ceramics provides a number of high-quality products and services that help drillers. The balance sheet makes me think the bottom is near for the stock and value investors should start snooping. Out CAPS community agrees, giving the stock a four-star rating (out of five), with 94 All-Stars rating the stock outperform. In this growing industry there should be plenty of profits to go around, and that makes CARBO Ceramics a good buy at its new low. Interested in reading more about CARBO Ceramics? Click here to add it to My Watchlist, and My Watchlist will find all of our Foolish analysis on this stock.